The Sharks finished the regular season as Presidents' Trophy champions with 53 wins and 117 points, both franchise records. 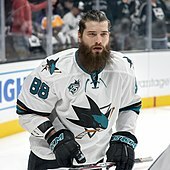 Despite their successful regular season, the Sharks were eliminated by the eighth-seeded Anaheim Ducks in six games in the first round of the playoffs. The team was heavily criticized[by whom?] for once again failing to succeed in the post-season. General manager Doug Wilson promised the team would undergo significant changes in the off-season. In the 2009 off-season, Wilson held to his word with many major moves. 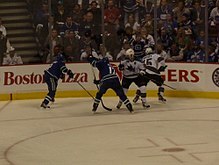 The first was Christian Ehrhoff and Brad Lukowich to the Vancouver Canucks. It was widely believed[by whom?] 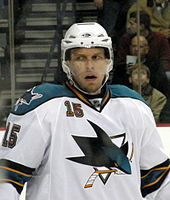 that San Jose made this trade so it could free up salary cap space to make a second trade: Milan Michalek and Jonathan Cheechoo were sent to the Ottawa Senators in exchange for Dany Heatley and a draft pick. Assistant coach Todd Richards left and was replaced by Matt Shaw. Aside from the trades, several contracts were not renewed, including those of Mike Grier, Marcel Goc, Tomas Plihal and Alexei Semenov. 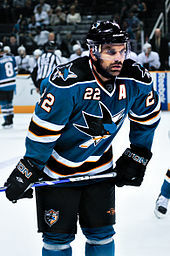 The Sharks finished the 2011–12 season with a 43–29–10 record, good for 96 points and the seventh seed in the Stanley Cup playoffs. However, after winning Game 1 of their first round series with the St. Louis Blues in overtime, they lost the final four games of the series, marking the second time they lost in the Quarter-finals under Todd McLellan. Despite the underachievement[according to whom?] of the previous year, it was announced that McLellan would remain on the bench for a fifth season. 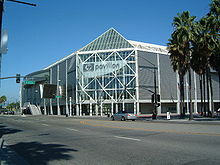 The Sharks have historically had rivalries with two other California teams, the Anaheim Ducks and the Los Angeles Kings. 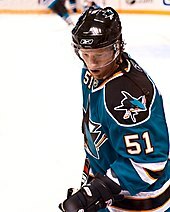 Wikimedia Commons has media related to San Jose Sharks.